The links below can be used to reach the online bookshops. This site also has links to other Amazon sites in USA, Canada, China, France, Germany, Italy and Japan. Owned by Amazon, it concentrates more on general books rather than "bestsellers". The online shop of the large bookshop chain. A large and long-established general bookshop. This is well-known as an academic bookshop but it also serves as a large general bookshop. High Street retailer with a large general online bookshop. A large online bookshop with a dedicated travel section. A bookshop aimed at travellers. A general bookshop, with books on Africa and a section of books in Afrikaans. What`s in the website ? The Leaning Tower of Pisa. 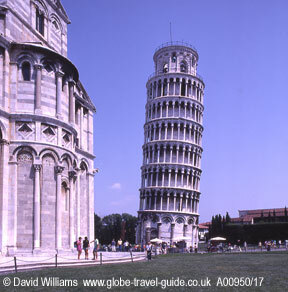 This was built in 1173 in Pisa, Italy, and started to tilt even before it was finished. This is one of Europe`s most famous monuments and it draws countless visitors who marvel at this gravity-defying masterpiece.